This is a reverse calabash by Jerry Zenn, pipe maker from Kaoshiung, Taiwan. Click on this. I’m so grateful he made this pipe to give me. 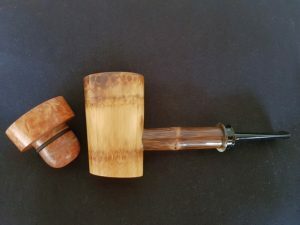 Jerry uses a combination of materials to make this unique pipe: aged briar, vintage Taiwanese bamboo and horn, mainly. This is the third reverse calabash he has ever made and I’m extremely pleased with it.